What a handsome, fluffy boy you are. Since you are small, you dig small holes. Hi Mico in Germany! Happy Pet of the Day! Aww! Be still my heart! 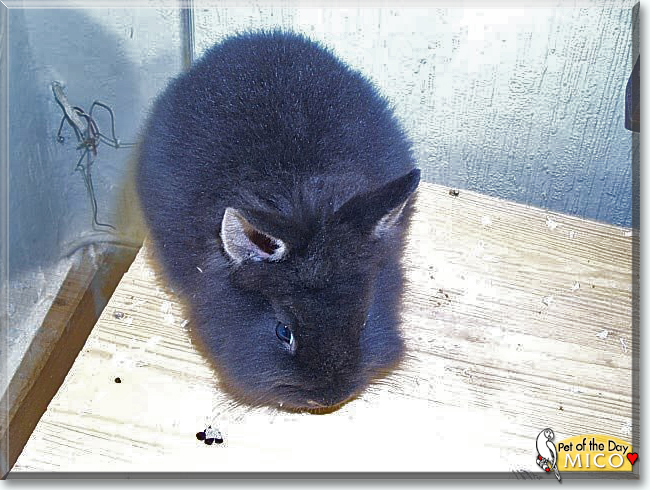 What a beautiful, fluffy, "Russian" Dwarf bunny boy you are, Mico! You may be a wee one in size, but when it comes to personality and heart you're as big as they come! How lucky your human is, having a best furry friend as beautiful, as playful, as sweet and loving as you, Mico! Inside and out, they just don't come any more special than you! You truly are a treasure, Mico, simply THE BEST!!! Thanks for the BIG smiles, sweetheart! Meeting you today has truly brightened my dark and rainy day! I hope you're enjoying a very special day of celebration...being treated to extra "free time" (hopefully out in your garden...digging hole, hehe); munching on yummy bunny treats; cuddling with your human, being loved and pampered to pieces! Lots of love, snuggles and kisses to you brave, beautiful Mico, our very special and most deserving Pet of the Day, EVERY day! Dearest Mico, you are adorable! What a precious Dwarf Rabbit you are, with that soft-looking Russian fur and that sweet face with those lovely big dark eyes. You have the most delightful personality, too. You are very brave, even though you're so small! You're sweet and cuddly, and you enjoy following your dear person around when you're outside each day for playtime and exploring. On nice days he/she takes you out to the garden, where you like to dig holes.. just small holes since you are a small rabbit! You two love each other very much, don't you. What a wonderful love-filled home you share! Congratulations, darling Mico, on being chosen today's Pet of the Day! We hope you and your dear person and all your family and friends are enjoying a fine celebration, full of fun and lovies and all your favorite games and treats. What a handsome Dwarf rabbit you are, Milo! You like to go in the garden and dig small holes.